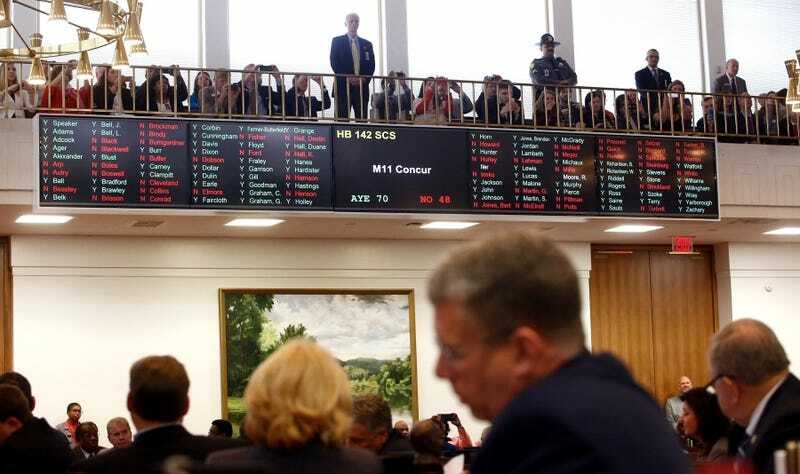 After two quick votes by the Rules Committee and the Senate, and a lengthier debate in the House, the North Carolina General Assembly voted today to pass House Bill 142, the replacement of House Bill 2. HB2 banned cities from drafting their own anti-discrimination ordinances or setting the minimum wage, and required transgender people to use the bathroom matching their birth certificate. The NCAA, which did not respond to our request for comment, supposedly extended the deadline for the state to repeal the law to Thursday, potentially allowing for North Carolina to rejoin the list of states eligible to host future postseason events if its state government voted yes to a repeal. To the chagrin of multiple House members, North Carolina lawmakers placed the bill on a fast-track voting schedule to accommodate this schedule; it passed by a 2-to-1 ratio in both the House and the Senate. Civil rights groups, such as the ACLU and NAACP, both opposed HB 142, saying it does not take the necessary steps to repeal the damage caused to the LGBT community by HB2. The Senate Rules Committee approved HB 142 via voice vote—WRAL reports that there was opposition, but not enough to hold back the “ayes.” The bill received little pushback when it progressed to the Senate floor, save for the remarks of one of HB2's main authors and sponsor, Dan Bishop. Senate minority leader Dan Blue, a Democrat from Wake County, supported the bill, saying that while it wasn’t perfect, he would vote yes in the broad interests of “tens of millions” North Carolinians. Senate leader Phil Berger, a Republican—the Republicans hold a supermajority in the North Carolina House and Senate—followed him, admitting to the Senate that “compromise is difficult” and he didn’t know “many people that are extremely happy about where we are,” but HB 142 was worth passing due to the limited window of opportunity. Tellingly for both parties, Bishop was the only senator to voice his opposition of the bill on the floor. He said passing the bill would be “a step backwards,” claiming that “this bill is at best a punt. At worst it is a betrayal of principle.” The bill passed the Senate, 32-16. Both sides’ issues with HB 142 surfaced in the House. The reasons were numerous: the power of state government vs. local government; the influence of the NCAA; the harmful avenues for LGBTQ discrimination HB 142 still affords the state government; the rushing of the bill; and, of course, God. Depending on which side of the aisle a particular member sat, the same reasons were applied to support two distinctly clashing ideologies. The first is that of the liberal perspective believing HB 142 did not go far enough to protect the people HB2 purposefully harmed under the guise of being an assertion of state power. These Democrats argued that the House should not rush to vote for a bill that furthers discrimination just to possibly appease the NCAA. The second ideology came from the conservative side, which is very clearly still struggling with the very idea of transgender people existing, let alone co-existing, in American society. They cried “faith!” and “God!” and “Bible!” They slammed the cowardly governor and legislators that would allow the NCAA to dictate the removal of HB2—a righteous law that multiple members claimed was designed to protect themselves, their daughters, and their wives. This all played out on the House floor. Initially, several members used their time to argue that a vote on the bill should be put off until next Tuesday so that they could review it with their constituencies. This was rebuked by Democratic representative Darren Jackson, who urged his fellow legislators to vote no today. That sentiment of genuine concern for the group most maligned by the legislature’s idiocy and ignorance over the past year was voiced by the House’s two LGBT members, Deb Butler and Cecil Brockman, who both opposed the bill, saying it failed to set a strong enough precedent discouraging discrimination against North Carolina’s LGBT community. Both Brockman and Butler also pointed out that at no time during the gutting and re-drafting of HB 142 as the solution to HB2 were any members of the LGBT community contacted or asked to advise on the language and consequences of the bill. Things got chippy—at least relative to the U.S. version of politics—when Durham Democrat Mickey Michaux was accused by a member of the opposing party of dressing down the Republican party when he was yielded the floor. Michaux responded by saying that was indeed exactly what he was doing, because despite their supermajority and dominance of the General Assembly legislation, “you come to us to help alleviate the trouble you got us into to start with.” Michaux voted yes, saying he did so to support Cooper and would fight for LGBT rights in the future. After giving an impassioned speech about how the decision tore at her soul—“I still don’t know how I’m going to vote,” she said while speaking to the House—Wake County Democrat Yvonne Lewis also voted yes. The bill is now on its way to governor Roy Cooper’s office, where he will presumably sign it into law, giving the state back its precious basketball tournaments while still allowing it to rank among the worst states in the union for gay and transgender men and women. Win-win.